In two weeks we might already have had the first night with frost or some snow. Those tomatoes which are still green will never ripen and the tomato plants will looks like cooked spinach after the first frost. 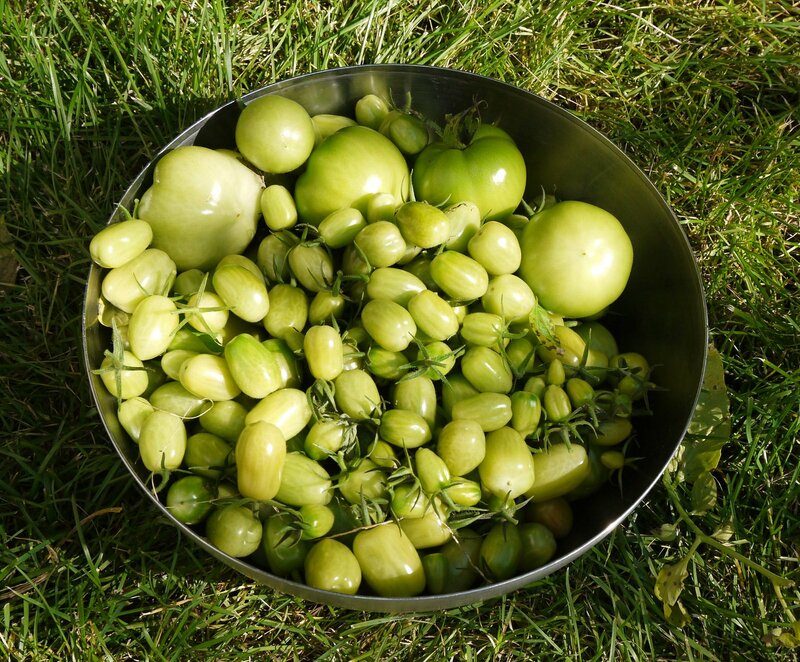 Now is the right time to harvest all the remaining tomatoes and make fermented green tomatoes, delicious. To ferment the tomatoes you will need a ceramic fermentation crock or a large glass jar. I use a large 5 liter jar. We start by preparing a brine because we use hot water for the brine and it needs to cool down before you can submerge the tomatoes in the brine. 1 liter of brine will roughly fill all the gaps between the tomatoes in a 5 liter jar. To be sure we will prepare 1.25 liters of brine. Bring 1.25 liters of normal tap water to boil. This way we get rid of all the gases dissolved in the water especially oxygen and chlorine. 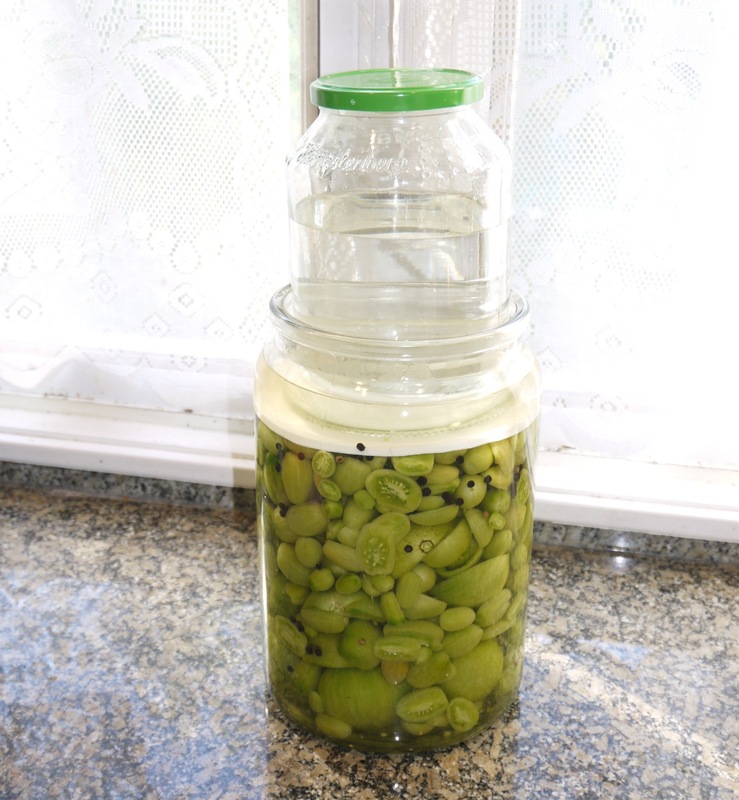 Fermentation with lactobacillus works only in absence of oxygen it is therefore important to reduce the oxygen content of the brine. After boiling the water you add salt and let it cool down to room temperature. We need 1 flat table spoon of salt for every 250ml of water. In other words we need 5 table spoons of salt to make 1.25 liters to brine. The water needs to be no more than hand warm before you can submerge the tomatoes into it otherwise you will kill all the naturally occurring lactobacillus bacteria and then the fermentation will not start. While the brine is still cooling down we can wash the tomatoes and cut them in half. Give all the cut tomatoes into the fermentation jar but wait with adding the brine until the brine is cold or maximum luke warm. Add brine until all the tomatoes are under water (salt brine). I add as well some pepper corns. Other good spices to use are dill and garlic. The fermentation crock or glass jar in my case has to be sealed such that very little outside air can enter the jar and especially no air should get close to where the tomatoes are. I put a small plastic plate onto the tomatoes and I have a second jar that fits tightly into the first jar. I fill that second jar with water and it pushes the plastic plate down. This keeps all the tomatoes under brine with no tomatoes floating on top. Gases and some foam will form during the fermentation. Make sure there is enough space at the top for the gas to escape without creating too much mess. Keep the fermenting tomatoes in a cool and well ventilated space. I use my garage. The fermentation should start in about 1-3 days and you will see some white foam forming on top of the brine. 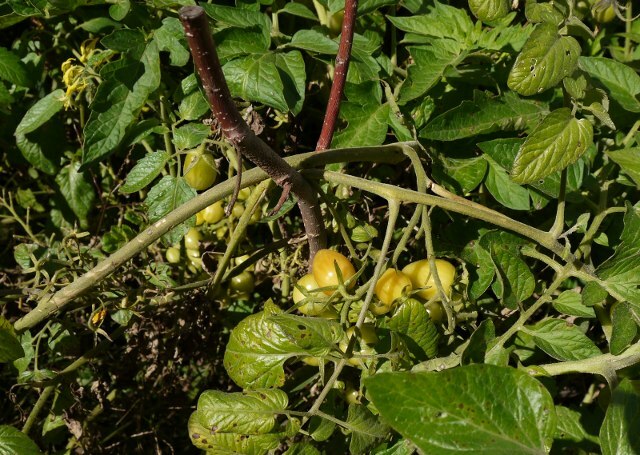 The tomatoes are ready in about 3 weeks but you can keep them for the whole winter. Fermentation is an excellent way of preserving the last sun rays from this year's summer.